The American crocodile is a species of crocodile that lives in the Americas, from the southern United States to northern South America. Its scientific name, Crocodylus acutus, means "Pointy-snouted crocodile", for the shape of its snout. American crocodiles feed mostly on fish, but large individuals may prey on larger animals, such as deer. The crocodile looks like it is a log, and hides beneath the surface of the water. When the deer comes down to the water to drink, the crocodile lunges out of the water, grabs the deer in its jaws, and pulls it underwater, where it drowns. After the deer is dead, the crocodile will grab a piece of meat in its jaws and spin around in a "death roll". American crocodiles are a somewhat aggressive crocodile species, and have been known to attack humans. Attacks on humans are rare, but happen most often in Mexico. The American crocodile's range in southern Florida overlaps with that of the closely related American alligator. However, while the American alligator's range stretches as far north as Virginia, the American crocodile's range in the United States is confined to southern Florida. This is because alligators are much better at tolerating cold weather than crocodiles. The body temperature of alligators has been known to drop to 38 degrees Fahrenheit without any harm at all to the alligator. However, the American crocodile is better at tolerating saltwater than the alligator. 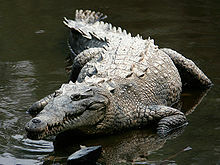 American crocodiles have regularly been sighted 140 miles away from shore in the Caribbean Sea. Wikispecies has information on: Crocodylus acutus. This page was last changed on 12 November 2016, at 10:46.